From a young age, Jan Matejko sketched historical monuments, national costumes, the interior of churches. In addition, he made extracts from the medieval folios of the Jagiellonian Library. He carefully collected all these drawings and sketches into his “skarbnik”. In 1860, Mateyko at his own expense published the album “Polish Outfit 1200-1795”, consisting of 10 lithographs. “Skarbchik” helped him a lot with his work on this album. On each picture in the album – 9 scenes. 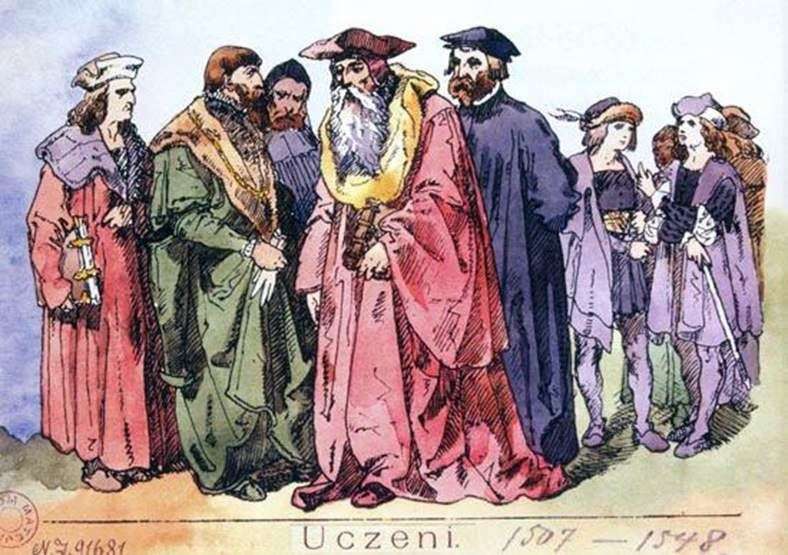 In the center – the king and courtiers, gentry and tradesmen. On the sides – schoolboys and teachers, clergy, peasants, Jews, knights, magnates, craft artisans. Hand-painted with watercolors copies Mateiko presented a gift to the Jagiellonian Library and the library to them. Ossolinskih in Lviv. In 1879, Mateyko issued notes listing the sources he used to compose an album. Description and meaning of the painting Polish national costume by Jan Aloizy Matejko.